....but the months passed, and I did not get any better. On January 4th (1899), the doctors tried another remedy. The cauterized me in 12 places on the spine. That was enough. I began to grow worse. Besides the usual pains, on January 28 I began to suffer with an unbearable headache. The doctor whom they called said that it was very dangerous (he called it a brain tumor). They could not operate because I was suffering with extreme weakness. I grew worse from day ot day, and on February 2nd they brough me Holy Viaticum. I made my confession and I was waiting to go and be with Jesus. It seemed that it would be soon. The doctors, thinking that I was no longer conscious, said among themselves that I would not live until midnight. Blessed be Jesus! One of my teachers in school came to see me and to tell me farewell saying that she would see me in heaven. But, nonetheless she begged me to make a novena to Blessed (now Saint- editor) Margaret Mary Alacoque, assuring me that she would gain for me the grace either of being cured perfectly, or else of entering heaven immediately after death. On the 23rd I began for the third time (that is, I intended to), but a little before midnight I heard a Rosary rattling and I felt a hand resting on my forehead. I heard someone begin saying the "Our Father", "Hail Mary" and "Gloria" and repeating them nine times. I could hardley answer the prayers because my pain was so intense. Then the same voice that said the prayers asked me: "Do you want to be cured?". "It is all the same to me" I answered. "Yes" he said "you will be cured. Pray with faith to the Heart of Jesus. 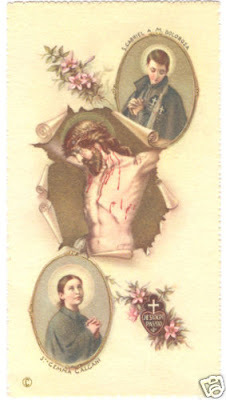 Every evening until the novena is finished I will be here with you and we will pray to the Heart of Jesus together". "And Blessed Margaret Mary?" I asked. "You may add three Glorias in her honor." The same thing happened for nine succesive nights. 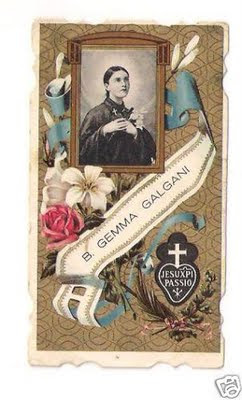 The same person (St. Gabriel Possenti -editor) came every evening, placed his hand on my forehead and we recited together the prayers to the Sacred Heart, after which he had me add three Gloria's in honor of Blessed Margaret Mary Alacoque. I sent for my confessor and went to Confession. The next morning I recieved Communion. What happy moments I spent with Jesus! He kept repeating to me, Gemma, do you wish to be cured?" I was so moved that I could not answer. Poor Jesus! The grace had been given. I was cured.